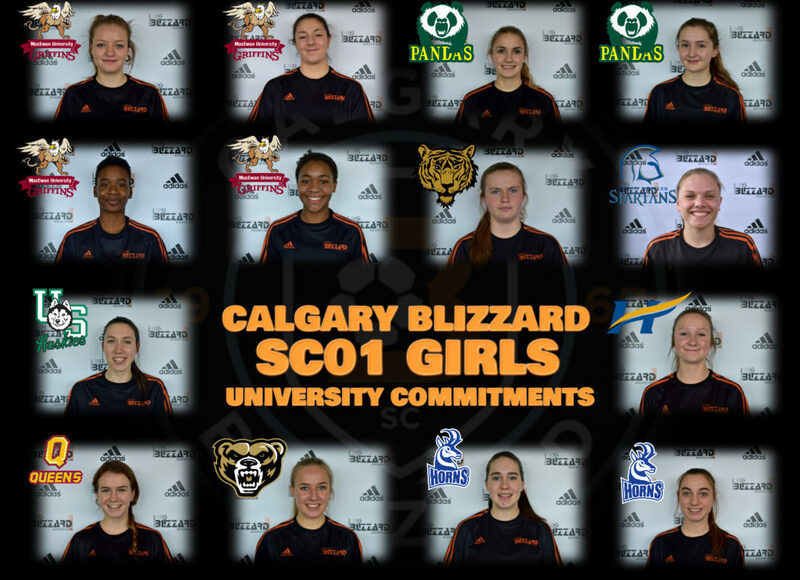 Calgary Blizzard is ecstatic to announce that our SC01 Girls team (coached by Diogo Raposo, Paul Burke and Kelly Blake) have fourteen University Commitments for the 2019-2020 graduating year. Thirteen of the commitments will be attending a USPORTS University and one will be attending a NCAA D1 University. Brooklyn (Midfielder) – Oakland University in Rochester, Michigan. Abbey (Defender), Shanice (Forward), Sofia (Midfielder) and Grace (Forward) – MacEwan University in Edmonton, Alberta. Maddy (Midfielder) and Rachel (Midfielder/Foward) – University of Alberta in Edmonton, Alberta. Keeley (Midfielder) & Claire (Defender) – University of Lethbridge in Lethbridge, Alberta. Aspen (Defender) – UBC Okanagan in Kelowna, BC. Rumer (Defender) – Trinity Western University in Langley, BC (received scholarship with her former club). Halle (Forward/Defender) – University of Saskatchewan in Saskatoon, Saskatchewan. Megan (Defender) – Queens University in Kingston, Ontario. Paige (Goalkeeper) – Dalhousie University in Halifax, Nova Scotia.